A Canvas for Fun: “Martian” culture. Painting. Sculpture. Ceramics. Jewelry. Music. Film. According to Charlotte Wattigny, the innovation manager for the San Marcos Convention and Visitors Bureau, the elements of San Marcos’ arts scene are varied, lively and growing. Wattigny’s job title alone suggests the city’s focus on developing “Martian” culture, as the locals call it. San Marcos is home to many kinds of “makers.” On the second Saturday of each month from March to December, dozens of artists showcase their work during the city’s Art Squared open-air market the San Marcos Courthouse lawn downtown. Increasingly, San Marcos’ buildings are coming to a colorful life as well. The Arts Commission encourages the creation of murals through a grant program that helps businesses pay for up to half the cost of artists’ services and materials. 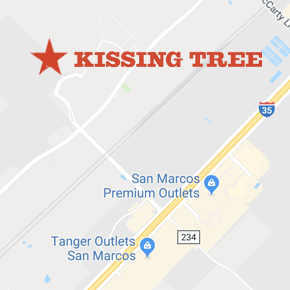 “This is an inexpensive investment with many benefits to the city of San Marcos,” Wattigny said. To date, the San Marcos Mural Arts Grant Program has funded murals at Children’s Park, Crook Park and the Old Justice Building, with two more in the works. The vintage postcard-inspired mural “78666,” which decorates Kissing Alley downtown, is one of the city’s best selfie-magnets. Fine art is found throughout the Texas State University campus, where contemporary exhibitions rotate at the University Galleries during the school year, and photography exhibitions fill galleries of the Wittliff Collections on the seventh floor of the Alkek Library, where year-round activities including major literary events occur. Commercially, the local glass scene is especially strong and includes two beautiful galleries. A large room at Wimberley Glassworks, the state’s premiere blown glass lighting and art glass studio, is set up like a theater for visitors to watch artisans at work. Silo Glass Studio and Gallery caters to creative types who want to be more hands-on, offering classes in making kiln-formed art glass. Recently, several artist-owned galleries have opened downtown. There’s painting and sculpture at Dahlia Woods, photography and the occasional performance at 218 Studio Works where the new San Marcos Cinema Club hosts screenings, and vibrant textile arts are the stars at Rio Claro. And you can almost always count on live music. Local musicians perform during each Art Squared event. Area talent is often the spotlight at the city’s clubs and restaurants. At Kent Finlay’s legendary Cheatham Street Warehouse, where George Straight and Stevie Ray Vaughan got their starts, you never know what surprises are in store during songwriters’ night each Wednesday . The beat continues outdoors with open mike performances on Monday nights at Eddy Durham park, named in honor of a jazz musician who grew up in San Marcos.